Evil Ever After is a 2006 horror film by director Brad Paulson. The film was made on a $100,000 budget. The cast of this film are genre experts and veterans. The film was produced by famous horror production company - CryptKeeper Films. Plot: Reformed cannibal, Bernie Grisso re-discovers his appetite after being used as a pawn in a malicious game started by his neighbor Ashley, her rotten group of friends and two sadistic cops. Armed with his legendary family's sword and a ravenous midget guardian, Grisso sets out to teach his tormentors a lesson they won't live to forget. 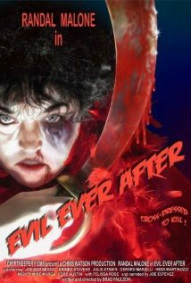 Joe Bob Briggs, Brinke Stevens, Felissa Rose and Julie Strain join the cast in, "Evil Ever After", the ultimate fairy tale shocker. Unfortunately this title is not currently available on DVD, There are some streaming sites online where it can be viewed. There is a limited edition print of this film in circulation. Please contact specialists or auction sites.